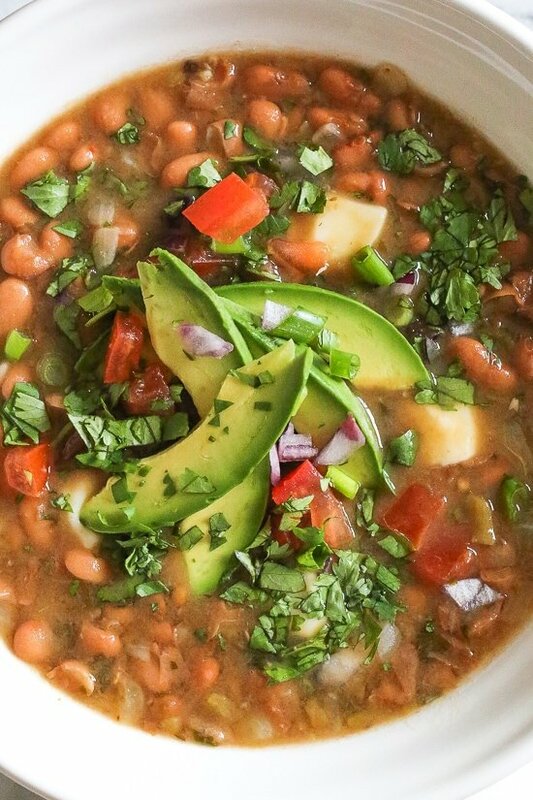 Mexican Pinto Beans made from scratch in the pressure cooker topped with tomatoes, cilantro, avocado and my favorite part, the cheese! Serve as soup or a side. 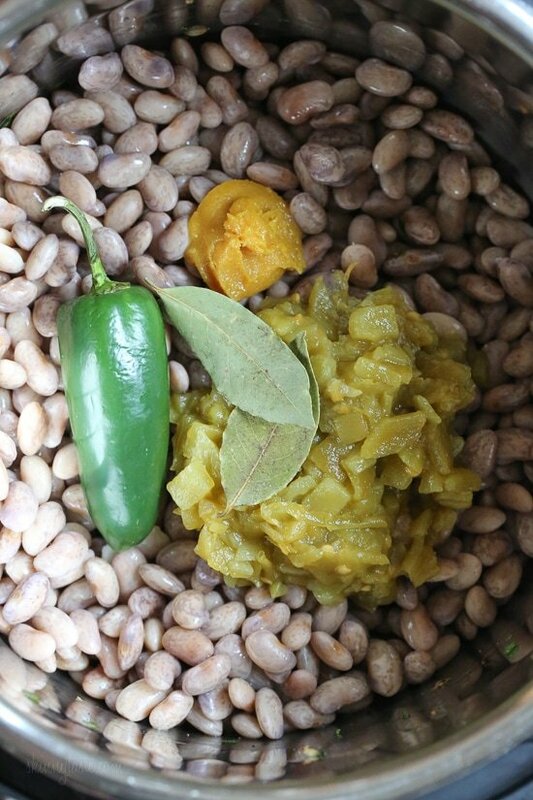 Growing up in a half Latin home with a Colombian mom, homemade beans made from scratch were a staple. Lazy Sundays Mom would have a big pot of beans simmering all day on the stove ready to feed anyone and everyone who came over unexpected, in fact she still does that today. 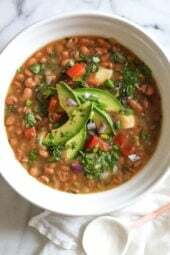 Beans also happen to be my husband’s favorite thing in the world to eat, I seriously think he fell in love with me after the first time he tried my beans. So when I want to make a dish I know Tommy will love, beans are on the menu. These Mexican Pinto Beans are life, made from scratch in the pressure cooker with onions, chile, jalapeno, tomatoes, cilantro, avocado and my favorite part, the queso! 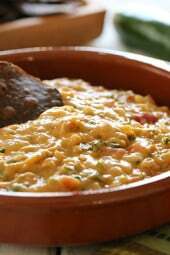 Soupy and mild in heat, they can be served as a soup or as a side dish over rice or with tortillas. And they couldn’t be any easier so I’m excited to partner with Capital One so you can make them too! Capital One is about to speak my love language, they have launched Savor the new credit card from Capital One that rewards customers with unlimited 3% cash back on dining, 2% on groceries, and 1% on all other purchases – for someone like me who heads out to the supermarket DAILY, and goes out to eat often for inspiration, this card’s for me. These beans are inspired by the pinto beans I recently had at a taqueria in Berkeley called Frijoles Con Todo, which basically means loaded beans. The beans were magnificent, I especially loved the chunks of soft queso Oaxaca which is similar to mozzarella string cheese, as well as fresh tomatoes, onions and cilantro mixed in at the end. I recreated them at home and Tommy RAVED about them! The Savor card was created to help people come together to create memorable moments around food, an important part of life and that’s exactly what I try to do here on Skinnytaste – share healthy recipes my family loves so that you can make them too. Last night as we gathered at the table for dinner he had two bowls and savored every bite – dinner was a success! Let the beans soak overnight in plenty of water, then drain them the next day. I always use a pressure cooker to make my beans, it cuts the cook time in half. To make them on the stove, double the cook time. Beans thicken the longer they stand. To make them soupier you can add more liquid. If reheating, add more liquid to loosen them up. For thicker beans, I let them cook uncovered for thirty minutes. You can thicken them more or less to your taste. See more Instant Pot or Pressure Cooker Recipes here! 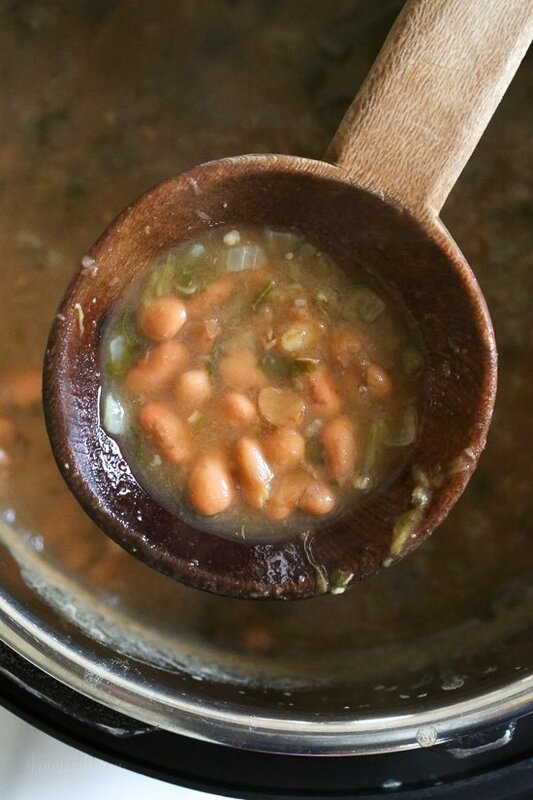 These soupy beans can be served as a soup or as a side dish over rice or with tortillas. Leftovers freeze well. Soak the beans overnight in water. Discard the water the next day. Set pressure cooker to saute, add the oil and chopped onion and cook until soft. Add the garlic, 1/4 cup cilantro and cook 1 minute. Set aside in a bowl. In the pressure cooker combine the soaked beans, green chilies, jalapeño, half onion, bouillon, bay leaves and 6 cups water. Cover and cook high pressure 45 minutes. Natural release. Discard bay leaves, half onion and jalapeño and stir in the reserved sautéed onion and season with salt. Press saute and cook uncovered until thickened, about 30 minutes, stirring occasionally. Meanwhile, combine the tomato, red onion, scallion and cilantro in a small bowl. Ladle beans into serving bowls, add the cheese and top with tomato mixture and avocado. Serve with lime wedges and tortillas if desired. Disclosure: This recipe is sponsored by Capital One. Thank you for supporting brands that make Skinnytaste possible to run. If cooking in the crockpot, would you sauté the chopped onion, garlic, cilantro first? Or just dump it all in the crockpot raw? I made these today and they are really great! Very filling and a big portion! Honestly, I think they’d still be great without the cheese and avocado, though they were delicious with. But the beans are great on their own with just the veggie topping. For those wondering if the 3 points per serving includes the cheese and avacado – I ran the recipe through the WW recipe builder and learned that YES, it does when figured as 8 servings. I’ve been making beans from scratch for decades and these are the BEST I’ve ever made. So unbelievably good!!! I substituted 1 chipotle in adobo as I was out of jalapeños. And my beans were soft and fully cooked after 20 minutes in the IP. Not sure why, but I always have to shorten the pressure cook times on beans. Great recipe! I was wondering if the nutritional information includes the cheese and avocado toppings? Delicious! I’ve made this several times now, and it’s my go-to. 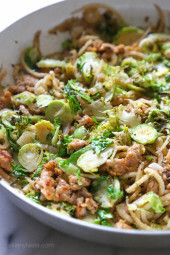 It makes a lot for my family of 3, so I incorporate the leftovers into other meals that week. I don’t soak the beans out of laziness. It doesn’t affect the texture/flavor, but it probably causes us extra gas. :). Instead of water I use chicken broth, and if I cut it to 5 cups instead of 6 I find I don’t need to sauté it for 30 mins after the natural release…the liquidity is just right. 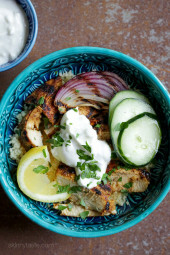 Thank you for an awesome, healthy recipe my family loves! Wowch! Ouch and wow factor at my home. I added spinach and cheddar to my bowl. Chile? One was a ghost pepper. The other a big question mark cause it was unmarked, frozen, grill roasted Chile from the summer garden.Waiting for the boys to get here. It’s a winner in my book. This was excellent! I do not have an instapot. But the crickpot worked fine. i soaked the beans 24 hours and then followed the instructions as written, but threw everything in the crockpot. Put on low for 5 hours, then on high for an hour when I got home from work. Delicious and not too spicy. (May add a second chopped jalepeno next time, and maybe a full onion). The can of green chilis is key as it adds a nice vinegary taste, and then the extras at the end make it even better,. Especially the fresh cilantro, avacado and squeeze of lime (again, that splash of acid is key). Served on hot rice. We all loved it! (I bought but forgot to add the cheese, but there are leftovers… so I have another chance). Thanks, Gina! If I wanted to double this recipe using the instant pot, would I double the liquid as well? OMG OMG I am blown away by this. Better than most restaurants! I wish I could upload my photo ???? served over a little rice and uses tostitos scoops. Thank you, Gina! I am gonna use the leftovers later this week over baked potatoes. If I wanted to double the recipe, in a six quart pit, would I double the liquid, too? I make these all the time and a friend has requested I make them for her thesis defense party. I dont think it will fit. This was amazing!!!!! Cooked in my slow cooker. The flavor is soooo good. The texture was creamy, and the beans were perfectly soft without being mushy. I am obsessed! Thank you so much! For how long and t what setting did you do these in the slow cooker? Thanks! Gina, thanks for another awesome recipe. Never mind! See my comment below. Soaked beans for 24 hours, then threw it in the crockpot for 5 hours on low, and then 1 hour on high when I got home from work. It was perfect. Do the beans taste spicy because of the pepper? I’m not able to eat very spicy foods, but love pinto beans. Would this taste good without the pepper? This tastes great! I was a bit skeptical – the ingredients didn’t strike me as super intriguing. But the taste is wonderful, even the cilantro I usually dislike adds to the dish. Love the different textures and flavors brought by the toppings. Will surely make this again. Do you have to soak the beans overnight or is there a way to do this without soaking? quick soak. You cover the beans with water in a pot and bring them to a boil and cover and let them soak for about an hour. I usually boil for about 10-15 minutes then soak for 45, but that’s not the way I’ve read to do it, I’m just impatient. Dump the water and add new cooking water and broths and seasoning. I just discovered your website and am so glad I did. I made these beans for dinner tonight. They’re so good!! Very savory. I put them over rice and topped them with the tomato, onion, cilantro mixture. I also made a lime garlic yogurt and put a dollop on top of the bowl. So yummy! I make this dish quite often and it’s nothing short of amazing…until the last two times. I don’t know what’s going on but every time I make them now, they turn out bitter. Nothing has changed in the way I prepare the dish so I’m at a loss. I’ve also tried this same recipe using black beans. The black beans were even more bitter! Any advice, ideas, etc? I love this website. THANK YOU!!! I made this tonight just using the stove, and it came out fabulous! My family ate it right up!! These are delicious!! And so easy. I accidentally didn’t buy a second yellow onion but happened to have two red onions, so I subbed the chunk of yellow onion for red but they still turned out great. Wow! Best beans ever! They are good on their own, but with the fresh tomato, onion, cilantro and avocado topping, they are absolutely amazing! Made these tonight and they were delicious!! So yummy and easy! I have a crockpot that I can saute in. So how long would I have to cook them in a crockpot for. I made this recipe this morning we have just eaten for lunch. Followed recipe exactly . Really delicious and tasty. Will be making again. One of our fave soups! Making it now. Thanks for a great recipe! Is the point value with cheese? I don’t have an instant cooker. Can these be made in the crock pot? I see the stove top instructions, but would love to use my slow cooker for them. These look wonderful but my husband is on a low sodium diet. Would they be as good if I eliminated the salt and bouillon? Any suggestions? Probably not, what if you used salt free beans? I was thinking there was little salt in the dried beans, but maybe I’m wrong. That’s why I zeroed in on the salt and bouillon. I will check out the beans. Thank you for your response! Can he do low sodium, iodozed sea salt? These are DELICIOUS. I served them with sour cream, cheddar cheese, and salsa on top. Don’t love avocados, so I made chicken to go along. Made them into little beans/chicken bowls for lunch and they are filling and reheat well! Everyone has been asking me for the recipe! Changes I made:1. Used canned beans. Decided to make these day-of, but will definitely plan better next time!! 2. Used the roasted garlic bouillon base from Better than Bouillon. 3. Used less cilantro because I’m one of those people who thinks it tastes like soap. 🙁 4. Used a half cup less water because I knew I wanted them less soup-like. Did you still make them in the pressure cooker with canned beans? How would you do these in a crockpot? I am doing some today and will likely screw it up. So easy to make and taste delicious!